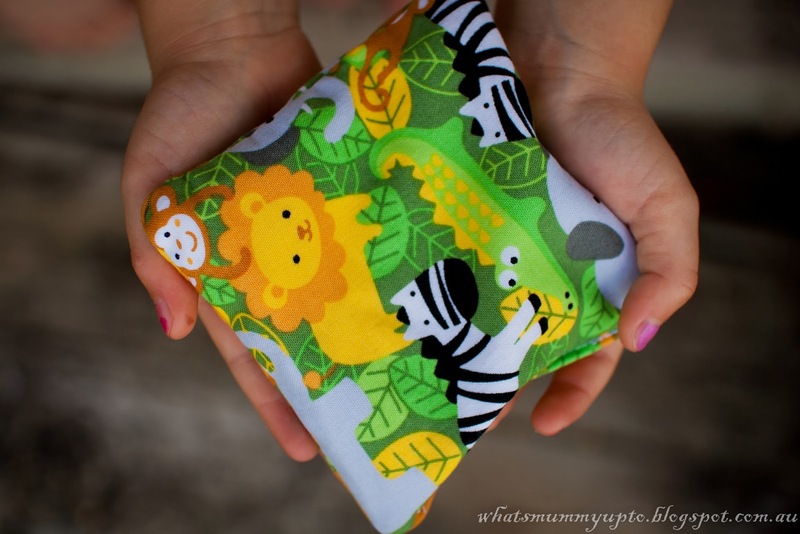 What's Mummy Up To ...: Tutorial: What's Mummy's Mummy Up To? - She's Making Beanbags! Tutorial: What's Mummy's Mummy Up To? - She's Making Beanbags! 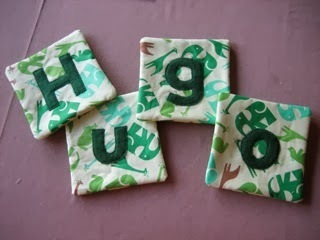 Have you ever wondered what you can make for your grandchildren and other ‘under threes’ for Christmas? This year I have decided to make beanbags. Beanbags are small squares of fabric that have been sewn together and filled with something dry – I use rice, but I have heard that dried peas, dried beans, split peas, lentils, or wheat can also be used. 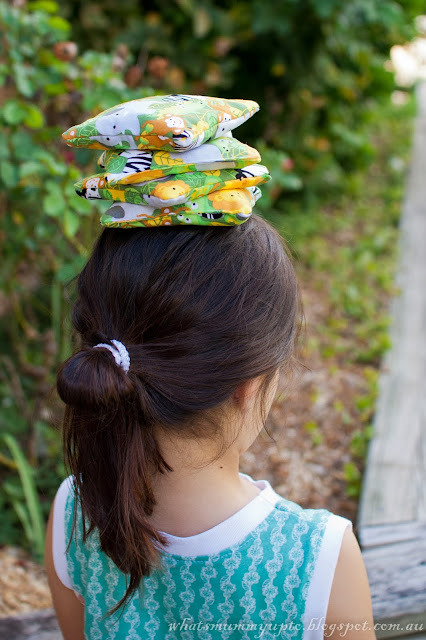 They provide a soft toy that can be thrown and caught, used to practice throwing into a container or ring, or used as a balance aid eg trying to walk around the room with the beanbag on your head. 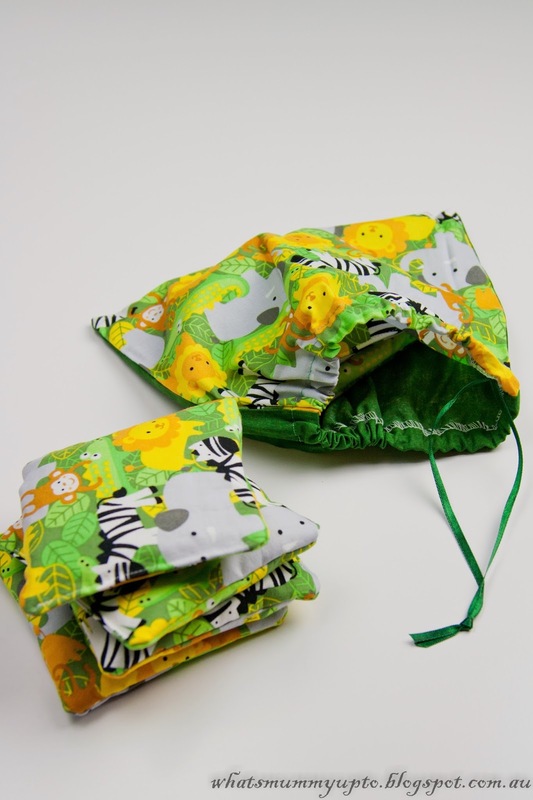 They're great for gross-motor development. - Approximately 1/2 metre/yard fabric altogether. You could use 1/4 metre of a cute fabric for the outer, and 1/4 metre of something plainer/cheaper like I've done for the lining, or you can just make the lining and outer from the same fabric. 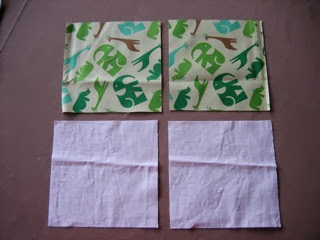 Step 1: Choose your fabric and cut out two 5½ inch x 5 ½ inch squares. 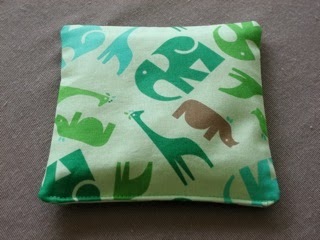 This is the size I have decided on, but if making for older children you may want to make them larger. Step 2: Cut out two more squares in calico as a lining (to keep your filling more securely inside). 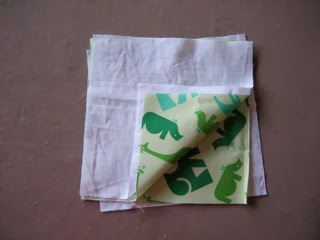 Step 3: Pin your squares together, placing the outer fabric right sides together, with a piece of calico on the outside of each. Step 4: Set your machine to a short machine stitch. 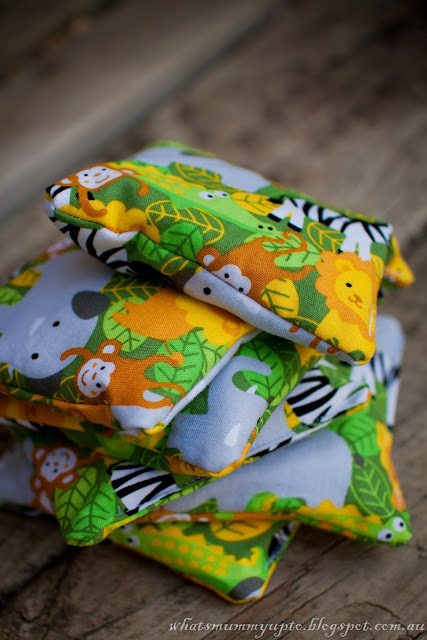 Using a ¼ inch seam, start sewing 1½” in from the bottom corner, reversing over the first few stitches. 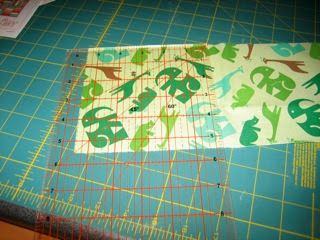 Continue sewing around all edges, pivoting at each corner, and finishing 2” from where you started. Reverse over last few stitches to secure them. Step 5: If you have an overlocker, neaten the 3 fully stitched edges. 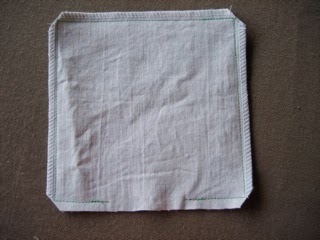 If you don’t have an overlocker, stitch around the edges of the square as before, just inside previous stitching. Step 6: Trim the corners (to remove bulk when turned through). 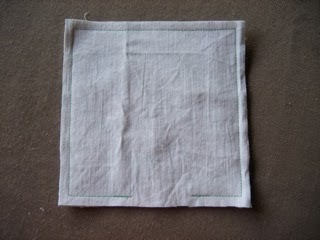 Using the opening, turn your square through so that outer fabric is now seen. Press. Step 8: Pin opening closed. Place an extra pin through your bag to keep filling away from seam you will be stitching. 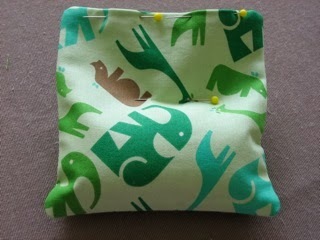 Sew your opening closed, using your small machine stitch, and stitching near the edge. Please note: In this design the beanbags are an ‘inside the home’ toy. If these dry fillings get wet or are machine washed the filling would be damaged and the toy would be spoiled for future use. 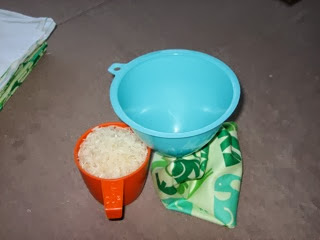 To make the beanbags an ‘outside’ toy for older children you could fill them with clean sand instead of rice. I’m going to give my beanbags as sets of 4 or 6. For some of the children, I thought I would put their name on the beanbags by adding felt letters to the top of each bag before sewing them together. 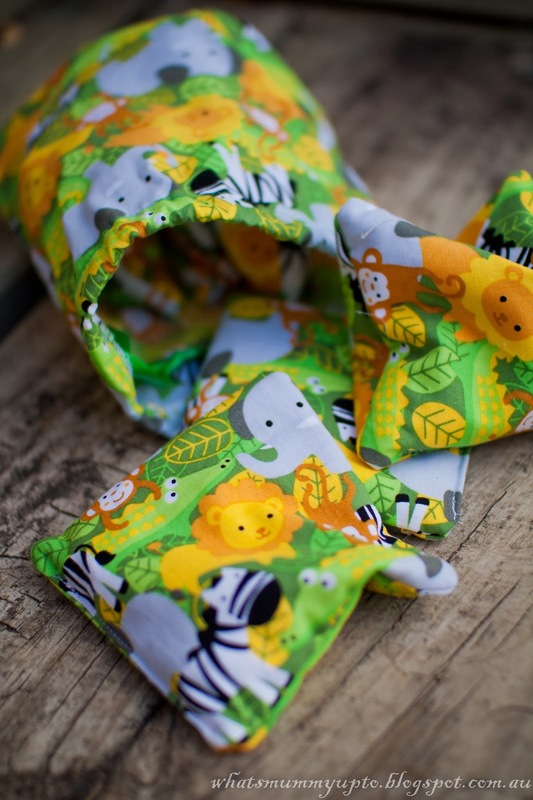 For the younger children (under 12 months old), I thought I might add tags to the outer edge of one bag and squeakers, rattles or cellophane paper (for the scrunchy sound) to others. These will be filled with polyester stuffing, not rice, so that they are washable. 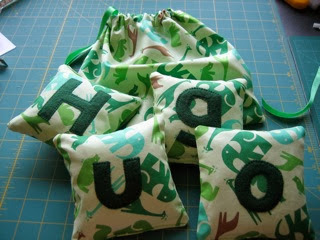 Now, you may have noticed that my very clever Mum has also made a matching drawstring bag for these cute beanbags. Stay-tuned for another post from her about making these matching bags, along with some other bags too … a great tutorial coming up very soon … I think maybe my Mum is getting into this blogging thing, huh! 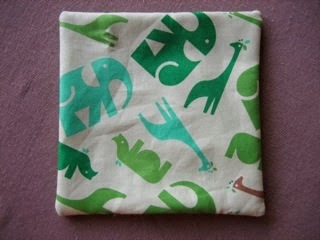 Oh, and Mummy's Mummy has kindly made a few extra sets of these. They're available for purchase at a VERY reasonable price at my Etsy store. See the "shop" tab at the top of the page. 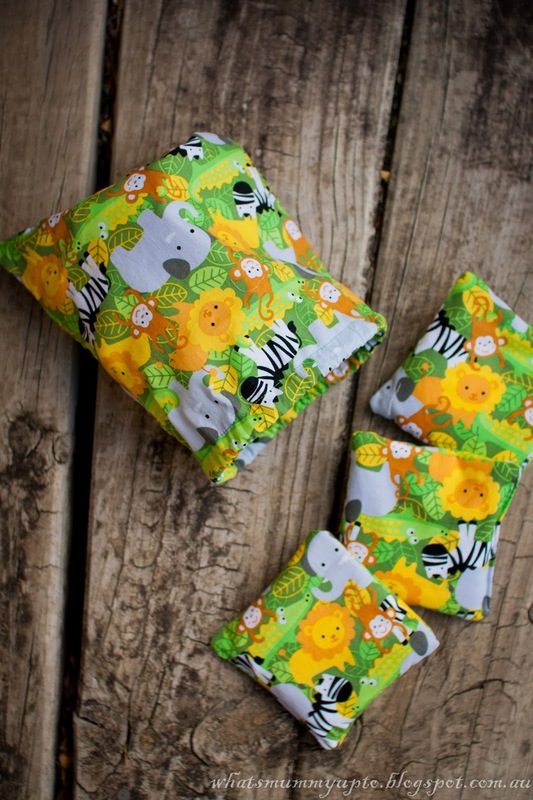 I never thought to give beanbags as gifts They are great for open ended play! That's fantastic Misty. Hope the recipients love them! I'd love to see them when you 're done. Feel free to email me with a pic!! These are great and I love that they have their own bag to go into! Thanks for sharing. Some Changes, and an exciting launch!